The steel grain silo is historically known for its resilience and functionality—not for its architectural beauty. But clever architects are repurposing the cylindrical buildings into affordable housing and stunning contemporary homes. With enough elbow grease and vision, the clunky metal structures can be transformed into surprisingly comfortable and modern residences. Need proof? 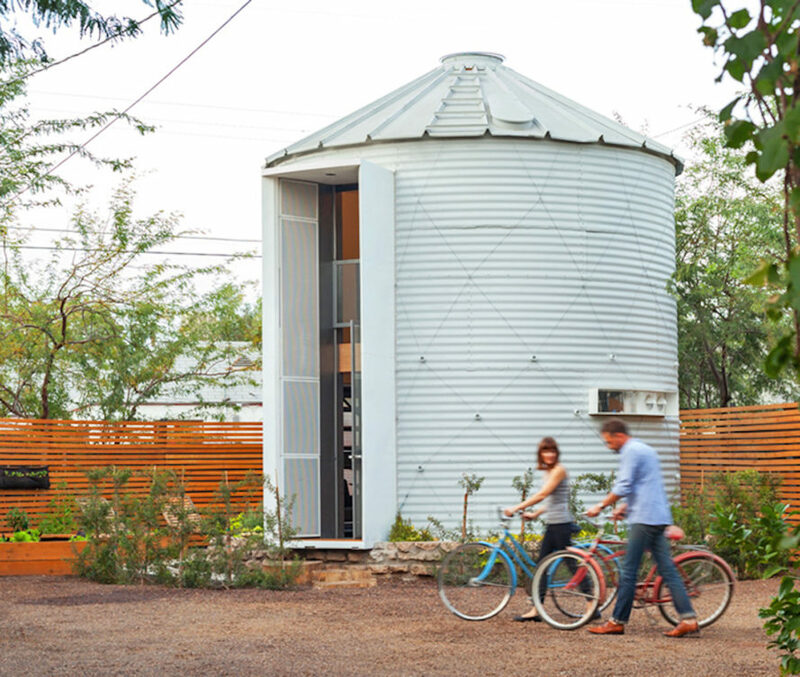 We’ve rounded up six of our favorite silo homes from around the world. Our favorite grain silo conversion project is this beautiful silo tiny home completed by architect Christoph Kaiser. Kaiser purchased the mid-century structure from a Kansas farmer and transported it to downtown Phoenix, where he reassembled and renovated the silo into a cozy 340-square-foot dwelling. To keep costs low, the quirky round home was outfitted with reclaimed materials and custom designs for a gorgeous interior. 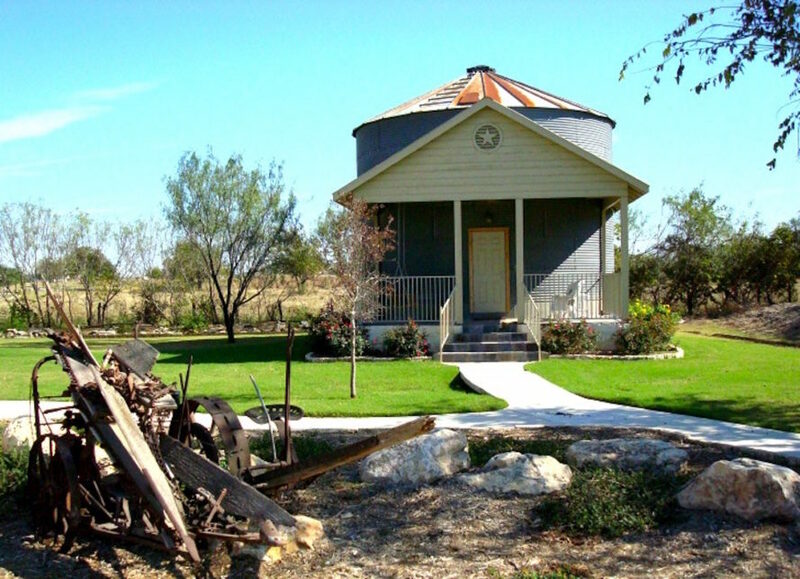 If you’d like to stay in a converted silo home but don’t want to commit to the purchase, consider the Gruene Homestead Inn that offers temporary lodgings within a 1940s grain silo. Located in New Braunfels, Texas, the silo home features a one-bedroom loft apartment that can accommodate two adults and two children. For a southern touch, the designers combined the silo with an outdoor porch and decorated the gabled awning with a Texan star. Over in Copenhagen, the city’s tallest historic grain silo is getting a massive makeover into luxury housing. 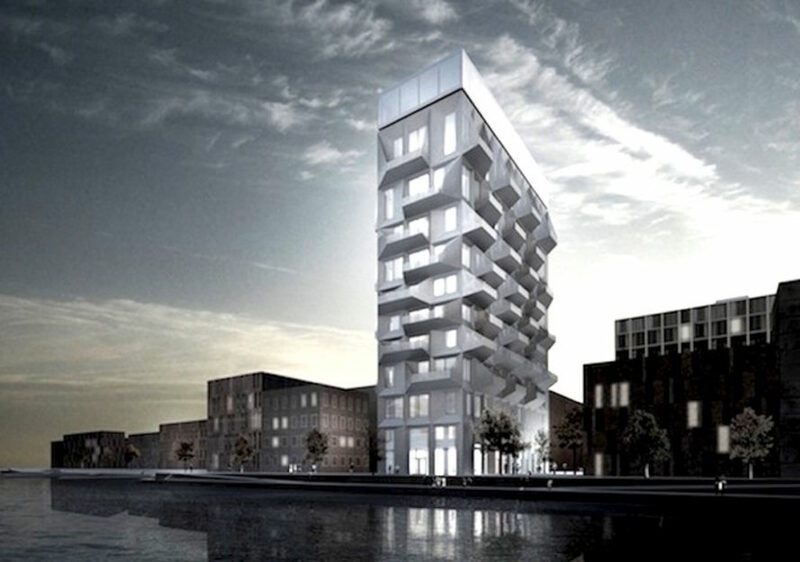 Danish firm COBE unveiled designs for a 17-story silo conversion that’ll feature 40 ultra-modern apartments. Slated for completion by the end of this year, “The Silo” will create a new kind of landmark for the city as the tallest adaptive reuse building in Nordhavn. 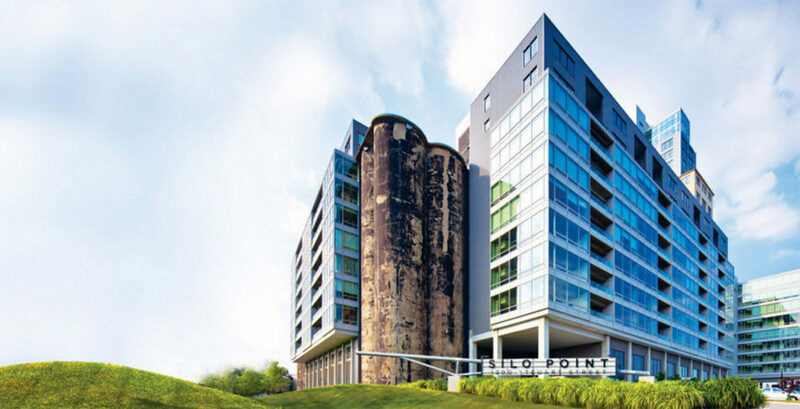 Thirteen grain silos and a grain tower were converted into the Silo Point luxury condominiums in Baltimore city. Led by Turner Development, the adaptive reuse project turned the abandoned Baltimore & Ohio Railroad grain elevator—once the largest in the world—into a modern city landmark and mixed-use space. The silos’ industrial past is celebrated in the design, from the materials palette to the landscaping that harkens to its agricultural past. Luxury condominiums aren’t the only type of housing to come out of the renovation of multiple grain silos. In Oslo, HRTB Arkitekter AS transformed an old grain elevator with 21 grain silos into a 19-story student housing complex called Grünerløkka Studenthus. The architect spruced up the rather drab and industrial concrete exterior with colorful glass for a touch of whimsy. C. F. Møller Architects collaborated with Christian Carlsen Arkitektfirma to turn a large silo in the Danish town of Løgten into a “rural high-rise” with 21 high-end apartments. 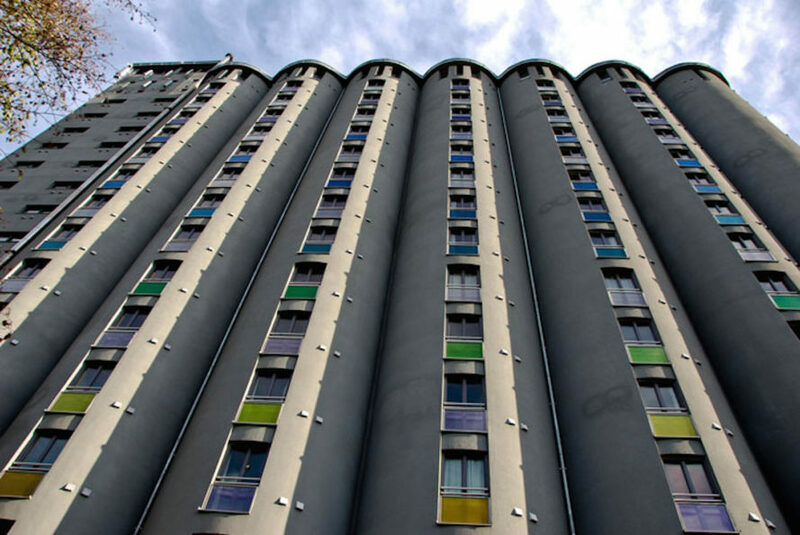 The architects left part of the silo’s body visible on the side of the new apartment complex to preserve a visual connection to the past, and built the protruding, colorful apartments around the steel structure. Check out these 6 modern homes made from abandoned grain silos. Midcentury grain silo home in Phoenix, Arizona Our favorite grain silo conversion project is this beautiful silo tiny home completed by architect Christoph Kaiser. Kaiser purchased the mid-century structure from a Kansas farmer and transported it to downtown Phoenix, where he reassembled and renovated the silo into a cozy 340-square-foot dwelling. To keep costs low, the quirky round home was outfitted with reclaimed materials and custom designs for a gorgeous interior. Gruene Homestead Inn in New Braunfels, Texas If you’d like to stay in a converted silo home but don’t want to commit to the purchase, consider the Gruene Homestead Inn that offers temporary lodgings within a 1940s grain silo. Located in New Braunfels, Texas, the silo home features a one-bedroom loft apartment that can accommodate two adults and two children. For a southern touch, the designers combined the silo with an outdoor porch and decorated the gabled awning with a Texan star. The Silo in Copenhagen Over in Copenhagen, the city’s tallest historic grain silo is getting a massive makeover into luxury housing. Danish firm COBE unveiled designs for a 17-story silo conversion that’ll feature 40 ultra-modern apartments. Slated for completion by the end of this year, “The Silo” will create a new kind of landmark for the city as the tallest adaptive reuse building in Nordhavn. Silo Point Condos in Baltimore, Maryland Thirteen grain silos and a grain tower were converted into the Silo Point luxury condominiums in Baltimore city. Led by Turner Development, the adaptive reuse project turned the abandoned Baltimore & Ohio Railroad grain elevator—once the largest in the world—into a modern city landmark and mixed-use space. The silos’ industrial past is celebrated in the design, from the materials palette to the landscaping that harkens to its agricultural past. Grünerløkka Studenthus in Oslo Luxury condominiums aren’t the only type of housing to come out of the renovation of multiple grain silos. In Oslo, HRTB Arkitekter AS transformed an old grain elevator with 21 grain silos into a 19-story student housing complex called Grünerløkka Studenthus. The architect spruced up the rather drab and industrial concrete exterior with colorful glass for a touch of whimsy. 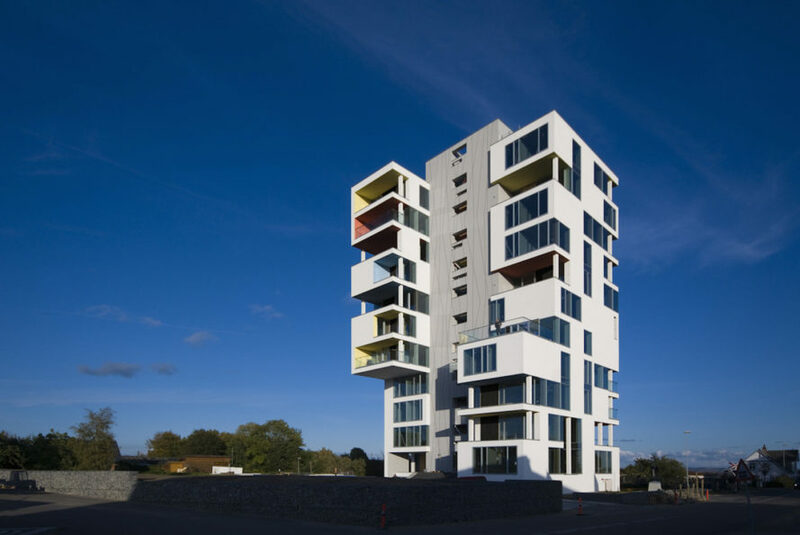 Sil(o)houette in Løgten C. F. Møller Architects collaborated with Christian Carlsen Arkitektfirma to turn a large silo in the Danish town of Løgten into a “rural high-rise” with 21 high-end apartments. The architects left part of the silo’s body visible on the side of the new apartment complex to preserve a visual connection to the past, and built the protruding, colorful apartments around the steel structure.